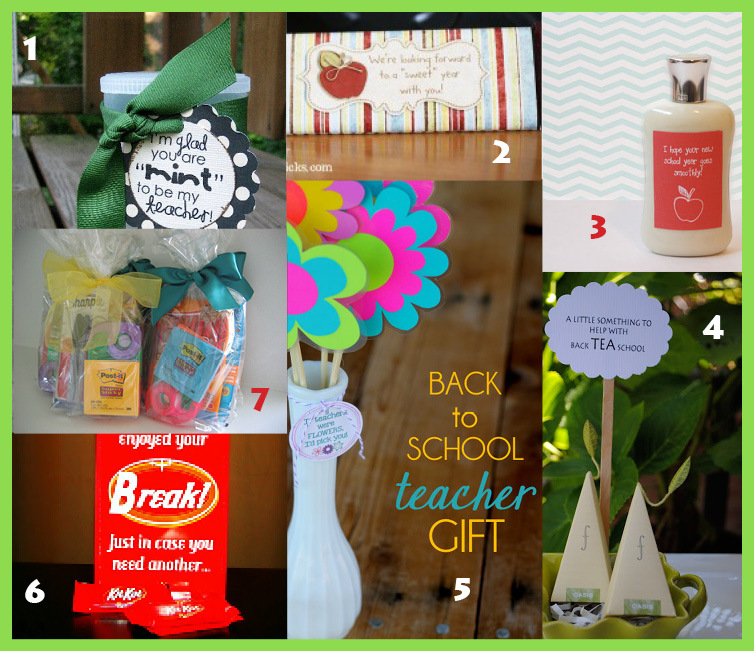 Here are 7 clever ideas for cute teacher gifts for the first day of school. I picked all of these because they are simple to make, affordable and thoughtful! I don’t know about you but back to school is a crazy time! Getting the kids back on a normal sleep schedule, getting them organized with school supplies, finding back packs and lunch boxes and so on makes that week before school a busy one! Yet the idea of sending our little ones off to kindergarten with a nice note of appreciation is such a lovely thought. 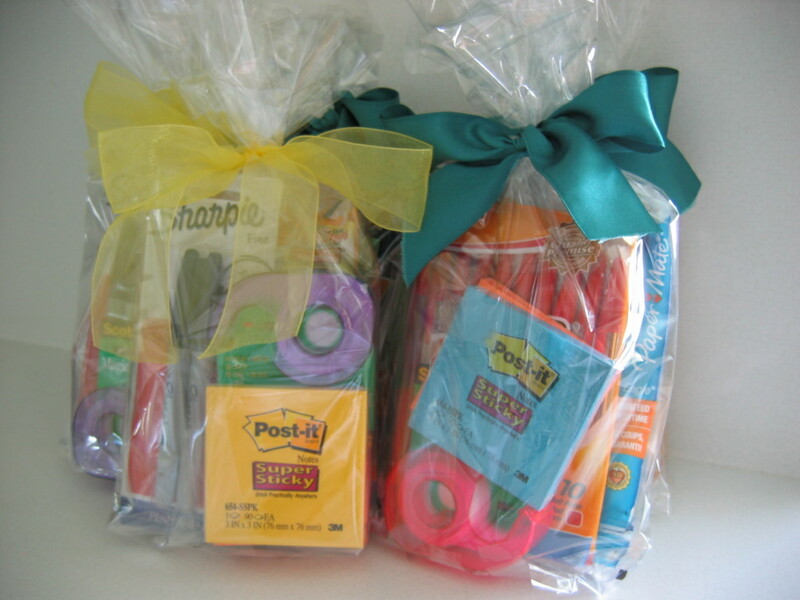 And of course, an excuse to make something… let’s get crafty! I loved the creative use of the Crystal Light container for the packaging on this, as well as Andes Mints which are one of my personal favorite candies. Again, this is simple, flexible and affordable! Perfect for the first day of school. You will find the instructions at BrownPaperPackages. 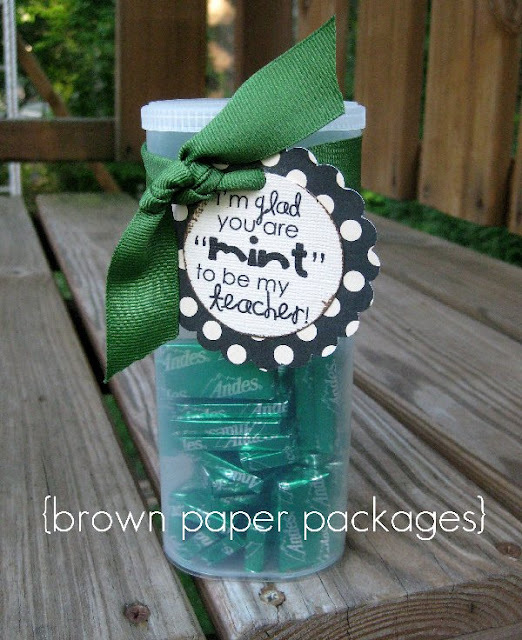 I loved this candy wrapper idea, so precious and simple to create. 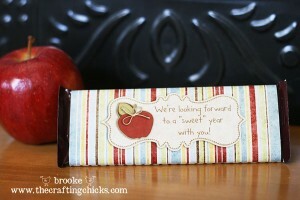 You could make your own wrapper or use the free downloadable template from TheCraftingChicks. This idea was so simple and creative. Plus, there are great printables that you can print quickly on label paper and stick to the lotion bottle. I love the saying on the bottles too: “I hope your year goes smoothly.” Thanks to Oops I craft my pants for this adorable idea and for the best blog name ever! These are clever sayings and a super cute gift idea with either tea or coffee from Jacolyn Murphy. 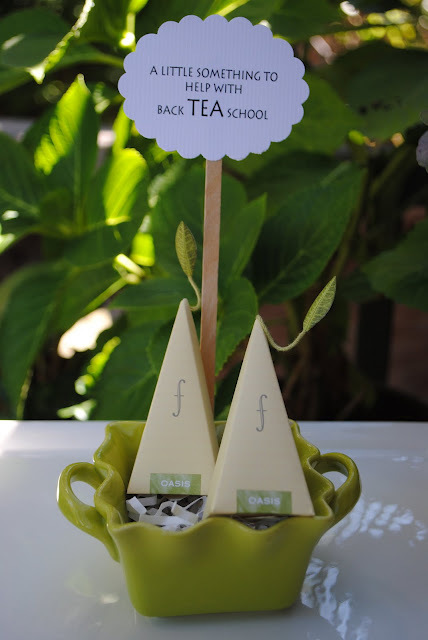 Plus, they are easy and quick to make in the crazy rush to get kids ready for school! The containers she used are a great shape so keep you eyes peeled for interesting mugs for this craft. 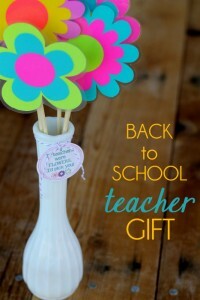 I think this might be my favorite gift idea, it’s so bright and colorful and would look great sitting on a teacher’s desk. Plus, I am a practical girl at heart and appreciate that the flowers are also magnets. You can get the instructions and the printable tag at Liluna.com. 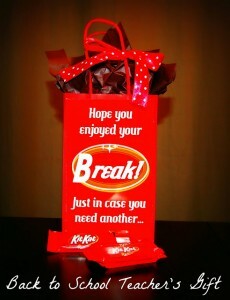 I liked Natalie’s idea for creating a cute gift bag filled with Kit-Kats. Teachers need a break, too. 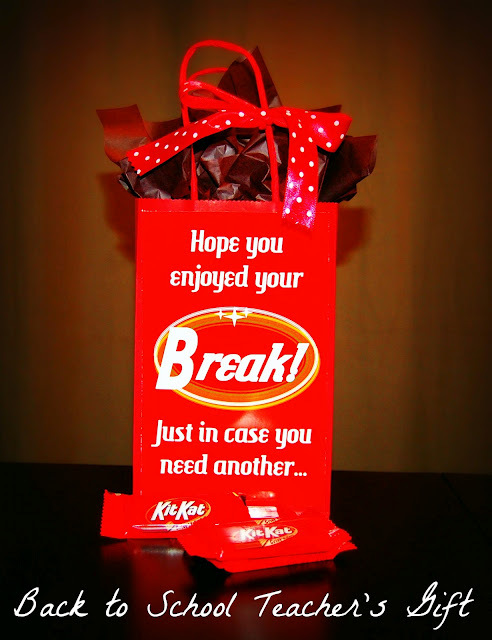 Here’s what Natalie said: “This gift is a little throwback to the whole ‘gimme a break’ slogan of the Kit Kat. Sure, this idea is super cheesy (and chocolatey), but what a cute little way to start off the new year. I just purchased a pack of Kit Kat bars for under three dollars and filled up a little gift bag. Attach the free-printable and dress it up with some tissue and a bow. That’s it!” Click here for instructions and the printable. Do you love school supplies as much as your kids? I know I do! I am always looking for good deals and coupons on pens, notepads and doodads. 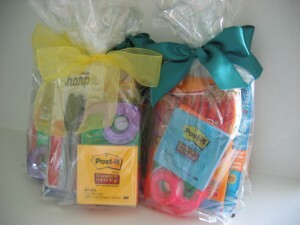 I loved this idea for creating cute gift bags of items a teacher can never have too many of! Plus, I love that Money Saving Mom used coupons to collect a lot of these items. Great way to save and share! So cute. I am so going to do the “you were “mint” to be my teacher to take to the Back to School Bash/meet the teacher next week — happen to have the Crystals Light container in my cupboard, score!